South African President Jacob Zuma has been met by protesters in London chanting "shame on you" on the last day of his state visit to Britain. Earlier, the leader sparked anger over calls for international sanctions on Zimbabwe to be eased. About 50 people gathered outside the South African High Commission, waving banners saying "Zuma save Zimbabwe". In response, President Zuma walked up a red carpet at South Africa House before turning and waving to demonstrators. Earlier on Friday, he held talks with Prince Charles at Clarence House on climate change, youth opportunities and the built environment. During his three-day state visit, the leader suggested sanctions should be eased to help Zimbabwe "move forward". But campaigners accused him of appeasing Zimbabwean President Robert Mugabe and believe he should be doing more to ensure fresh elections are called in the country. Gordon Brown has said Zimbabwe must show progress in key areas including democratic reforms before sanctions are lifted. At the protest, one man wearing a Mugabe mask held aloft a sign saying "Zuma - have another wife on me". The 67-year-old leader is a polygamist - following a Zulu tradition - and has taken a third wife. Rose Benton, co-ordinator of a weekly demonstration outside the Zimbabwean embassy, said: "The government of national unity isn't going to work, Mugabe isn't serious about making it work - he never has been. "What we need is Zuma to do something, " she said. 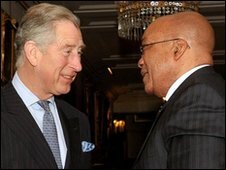 This has been the third state visit to Britain by a South African president since the advent of full democracy in 1994. Nelson Mandela came to the UK in 1996 and Thabo Mbeki in 2001.